1. What trade war? It was a scary week on the trade war front, but you wouldn’t know that from the chill response on Wall Street. The market barely flinched last week even as President Trump threatened global trade peace like no American president in modern history. Consider the alarming developments from just the past few days: The White House forged ahead with tariffs on $ 50 billion of goods from China. Talks to renegotiate NAFTA stalled. And Trump imposed tariffs on close allies Canada, Mexico and the European Union. “The threat of a global trade war has moved to DEFCON 4,” Viraj Patel, foreign exchange strategist at ING, wrote to clients on Friday. The response from allies was fierce. 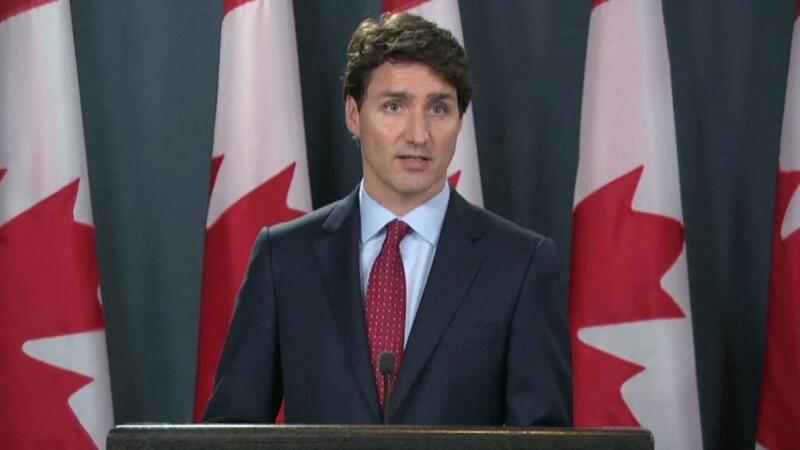 Canadian Prime Minster Justin Trudeau called it an “affront,” and prepared retaliatory tariffs that matched the United States’ dollar-for-dollar. The EU knocked Trump for “pure protectionism” and readied tariffs on bourbon, motorcycles and dozens of other American products. Mexico announced it would place tariffs on American exports. Yet Trump received a much calmer reaction from Wall Street. The S&P 500 retreated 0.7% on Thursday after Trump rolled out steel and aluminum tariffs on the three allies, but the market recovered those losses the next day. Stocks were flat on the week, and the Nasdaq is now up nearly 9% this year. Perhaps investors are shrugging it off as a negotiating ploy by an atypical president. Or maybe they’re just dizzy from the on-again, off-again trade war inside Trump’s divided economic team. After all, just two weeks ago, Treasury Secretary Steven Mnuchin declared the trade war was “on hold,” setting off a celebration on Wall Street. But Wall Street may be minimizing — if not ignoring — the rising risks from Trump’s aggressive trade agenda. Analysts broadly agree that tariffs are bad for the economy, dent robust business confidence and can paralyze investment decisions. The Chamber of Commerce estimates that Trump’s trade policies threaten as many as 2.6 million American jobs. Higher prices caused by tariffs also threaten to raise concerns about inflation as well as drown out the benefits from Trump’s personal and corporate tax cuts. Businesses that want to invest their tax windfall can’t because they don’t know what products might get slapped with tariffs. “The tariff talk is a clear negative for the economy and markets,” said David Kelly, chief strategist at JPMorgan Funds. So why is the market taking the escalation in stride? One theory from Kelly: Trump’s trade agenda is cooling an economy that was on the verge of overheating from Trump’s tax cuts. That in turn has eased fears of runaway inflation that would force the Federal Reserve to aggressively raise interest rates. “The inappropriate amount of stimulus is being watered down by all this tariff confusion,” Kelly said. He said that while tariffs are inflationary, the negatives from a trade skirmish are far more powerful. “In this case, two wrongs can make a right,” Kelly said. 2. Apple’s big show: The Worldwide Developers Conference begins on Monday, featuring keynotes from CEO Tim Cook and his top lieutenants. They’ll showcase Apple’s latest and greatest software, including iOS 12 and the next version of macOS. The next version of iOS is rumored to include tools that reduce people’s reliance on their smartphones. It could also feature an augmented-reality camera application. Apple may announce an update to the Watch and the Apple TV, too. Investors watch WWDC closely to determine what kind of features Apple (AAPL) might include in the next iPhone — by far the company’s biggest cash cow. Apple typically unveils its iPhones in the fall. 3. Business Roundtable’s CEO economic outlook: How are CEOs feeling about the economy? We’ll find out Tuesday. The Business Roundtable, a powerful lobby that represents major corporations, will announce the results of its second quarter economic outlook survey. The group’s constituents will discuss how much they plan to invest in their own companies and how many people they plan to hire over the next six months. They’ll also provide sales and GDP forecasts. President Trump’s new tariffs will surely be front of mind: The Business Roundtable staunchly defends free trade. Its member companies, which employ more than 16 million people, get about one-third of their sales from outside the United States. JPMorgan (JPM) CEO Jamie Dimon is the group’s chairman. 4. Google faces shareholders and lawmakers: Google’s parent company, Alphabet (GOOGL), will hold its shareholder meeting Wednesday. Though few expect any fireworks, one prominent shareholder group wants the company to tie its executives’ compensation to Alphabet’s ability to hit diversity targets. Google, like many tech companies, has struggled to hire and promote women and people of color. The measure is not expected to pass. The company will also face off with lawmakers this week. Google’s hometown of Mountain View, California, has proposed a “headcount tax,” which would force the company to pay for road repairs and traffic control and offset rising housing costs for low-income residents. The city council will vote on the matter on Tuesday. If it passes, it will be included as a ballot measure in the November election.